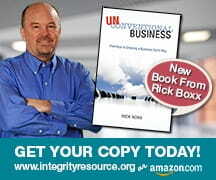 For years, these Integrity Moments have been sponsored by Integrity Resource Center. This week, however, we’re excited to announce our new name, Unconventional Business Network, and what it means to be an Unconventional Business Leader. We believe Unconventional Business Leaders are people with courageous faith. In the 1960s, Truett Cathy had trouble placing his stores in shopping malls because his stores were closed on Sundays, but Truett courageously chose to stand firm. Today Chick-fil-a’s profitability is the envy of the restaurant industry. If you desire to be an Unconventional Business Leader like Truett Cathy exercise courageous faith.